There’s never a shortage of music in NY. Tonight was the first of the sold out 3 night run at the infamous Brooklyn Bowl. Tickets were gone within seconds of the pre-sale on February 1 and regular sale on February 2, both VIP and GA. These local boys always play to a sold out crowd that fills the Bowl to capacity at 1,000 occupants. The good news is for those who lament about being shut out, there seems to always be a couch tour offered along with live streams by die-hard fans riding the rail. This particular show was taking place on the 45th Anniversary of the death of Ronald Charles McKernan who most of us know as “Pigpen.” He was a founding member of the Grateful Dead and played in the legendary band from 1965-1972. Additionally, the show was also taking place on International Women’s Day. The band paid homage to Pigpen in the first set by playing three songs from his time, including “Alligator” (1968 Anthem of the Sun), “St. Stephen” (1969 Aoxomoxoa) and “Dupree’s Diamond Blues” (1969 Aoxomoxoa). Then again, in the second set, JRAD included “The Golden Road (To Unlimited Devotion)” (1967 The Grateful Dead). This band, like the Dead on steroids, belts these songs out with incredible strength and style. They have their own improvisation and interpretation at an upbeat tempo. The group is led by the one and only Joe Russo (drums), accompanied by his friends Scott Metzger (guitar), Marco Benevento (keys), Dave Dreiwitz (Bass) and Tom Hamilton (guitar) and all of these guys take turns on vocals. This extremely talented group of fine musicians never disappoints and always plays to a sold out very enthusiastic crowd. There isn’t an inch to spare within this tight knit happy family of fans at the Brooklyn Bowl. So while the band celebrated Pigpen on this night, it was also International Women’s Day and well, JRAD surely did not disappoint the women; after all, women are smarter, right? JRAD honored this day and all the women late in the second set with “Men Smart (Women Smarter)” with the high energy crowd dancing and singing along clearly loving the vibe. This was the second in the three song encore which morphed into “Not Fade Away.” Towards the end of NFA, they added a Living Colour “Cult of Personality” tease and then Joe took the mic and said, “sorry, we played with Living Colour last night at Carnegie Hall, so we’re all children of the same era up here, sometimes that sh*t gets incepted.” He closed out the evening introducing his bandmates, jokingly referring to Tom Hamilton as “Vernon Reed” (Living Colour) on the guitar. A fantastic close to an outrageous show… nights 2 and 3 also sold out. 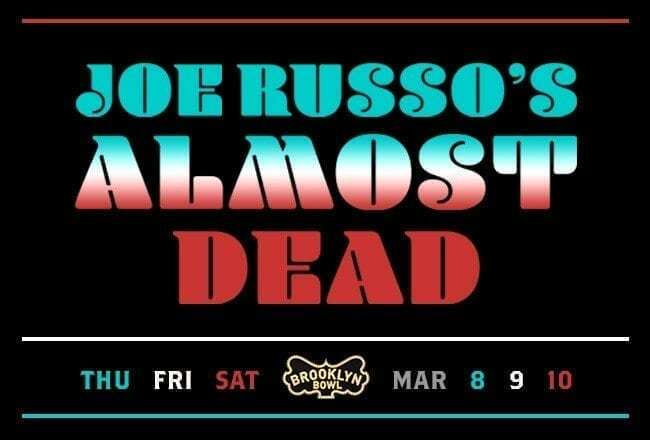 The JRAD March run came to an end on Saturday, March 10.